Soerke Peters is an award-winning international Chef whose far-reaching experience includes everything from a mastery of cuisine to corporate managerial experience. 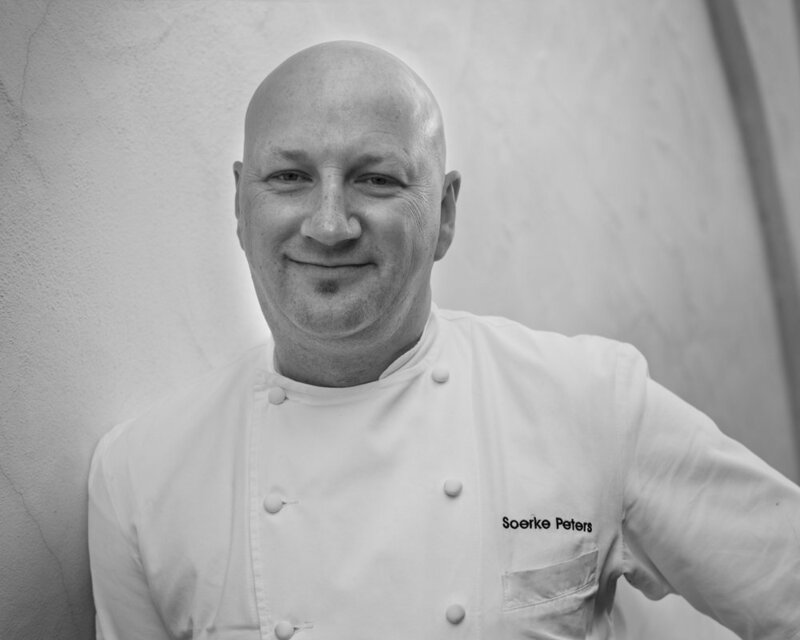 Chef Soerke Peters born and raised in Germany always had an interest in cooking. He decided to become a chef at the age of five. He remembers cooking with his grandmother as a young boy, and followed this path his entire life to become a chef. After his three year apprenticeship in Wilhelmshaven/ Germany he moved to Munich and worked at world class hotels and restaurants including a one and three Michelin Star rated restaurant. He went to Bavaria Hotel Training School where he became a certified Hotel Receptionist, Apprenticeship Instructor and Bartender. In 1990 he was hired as Executive Chef for the first World Fair in Russia/Siberia. In 1991 Chef Peters moved to New York City and immediately started working for Mr. Pino Loungo’s Toscorp, Inc., an emerging company that included Coco Pazzo and Le Madre just to name a few. Chef Peters’ timing could not have been better, and he fell in love with Italian cuisine. He learned the simplicity of Italian food and worked his way up to Corporate Chef overseeing 16 restaurants nationwide. In October of 2001 Chef Peters decided to move to Los Angeles, the new “Hot Spot” for great and creative restaurant concepts. While mastering Northern-Italian cuisine at Ca’del Sole in Los Angeles Chef Peters opened Froma on Melrose in West Hollywood. He was also the Executive Chef at the Sunset Restaurant in Malibu before taking the opportunity to move to Carmel by the Sea taking over Basil Seasonal Dining. Chef Peters sold his shares of Basil in 2017 and moved on the Village Corner in Carmel a 70 year landmark for locals.Village Corner became the second Certified Green Restaurant in Carmel in 2018. 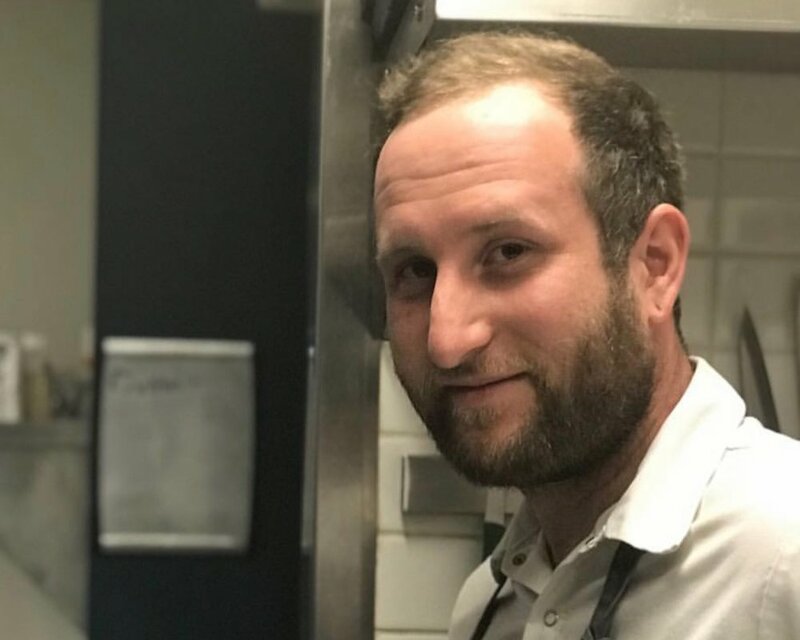 Peters pulled out of Village Corner at the end of 2018 to focus on his new project changing Lafayette Kitchen & Café to Etats-Unis (United States) French American Bistro. Chef Peters’ passion for Farm to Table and being sustainably responsible made Basil the first Certified Green Restaurant in the Monterey County. He is also the President of the American Culinary Federation Monterey Bay Chapter as Chair of the Green & Sustainable Committee. He serves currently as Vice Chair of the Carmel Chamber of Commerce and will be the Chair in 2019. Pamela Burns is the owner and chef of The Wild Plum Café a sustainable and organic farm to table full-service café, located in Monterey The Café features hand-crafted organic comfort food with a bakery and espresso bar. She has over 30 years’ experience as an entrepreneur and chef, having started the Baker's Wife, the 6th Avenue Grill, and the founder of The Monterey Pasta Company, as well. I have lived my entire life on the central coast or very near it, from Santa Barbara to Santa Cruz. My childhood was ﬁlled with sand-soaked days and fog drenched skies. My Mother was Mrs. Amazing. She began a career as a professional musician at the age of 14 or 15 and gave that up to start a family. In addition, she was an incredible cook, gardener and seamstress. Our house was always ﬁlled with the aroma of something good to eat and music of every kind. My Father was a merchant Marine. He loved to paint, draw and build ships in bottles. He was an amazing craftsman. My extended family included lots of Aunts and Uncles. Mostly farmers, we always had the best of the best. I always say the die was cast long before my culinary journey began that I would become a chef. I am so glad my journey led me here. Chef Joshua Plesh delights in using fresh local ingredients to make dishes that let the vibrancy of the ingredients shine. He shops three times a week in local farmers markets and buys local fish from local fishermen. Often the fish is less than 24 hours out of the water, and the menu varies according to catch. He has worked previously in many top tier restaurants on the west coast in LA, Seattle, Lummi Island. Chef Tony Baker began his career in England. Following his graduation from culinary school in Bristol in1989, Tony worked in several highly acclaimed restaurants around the country including Hintlesham Hall and Lucknam Park Hotel. In 1994, Chef Tony made the jump to the states. A celebrated chef and local radio and television personality, Chef Tony has appeared on “View From the Bay”, “Bringing it Home”, “The Rosy Chu Show”, and many other local favorites. He has also appeared on national television as the face and voice of the Ove Glove. Throughout the years, Chef Tony has demonstrated an uncanny ability to bring people together for fabulous food and unforgettable moments, doing his part to elevate the nation’s culinary standards. Chef Tony is often seen offering up his talents for local causes and community events. Because of his long-term relationship with grower, Ocean Mist, he is regarded as the “Artichoke Chef”. For 21 years, Chef Tony Baker and Montrio Bistro have celebrated the heritage and craftsmanship of local purveyors. From seed to fork, Montrio’s ingredients and menu change with the seasons, just as nature intended. Montrio and Chef Tony are proud to continue that focus, putting emphasis on the delectable, seasonal ingredients that come from the areas local farmers, ranchers and fishermen. Chef Tony’s commitment to sustainable ingredients and local growers has earned him praise and acclaim on a national level. 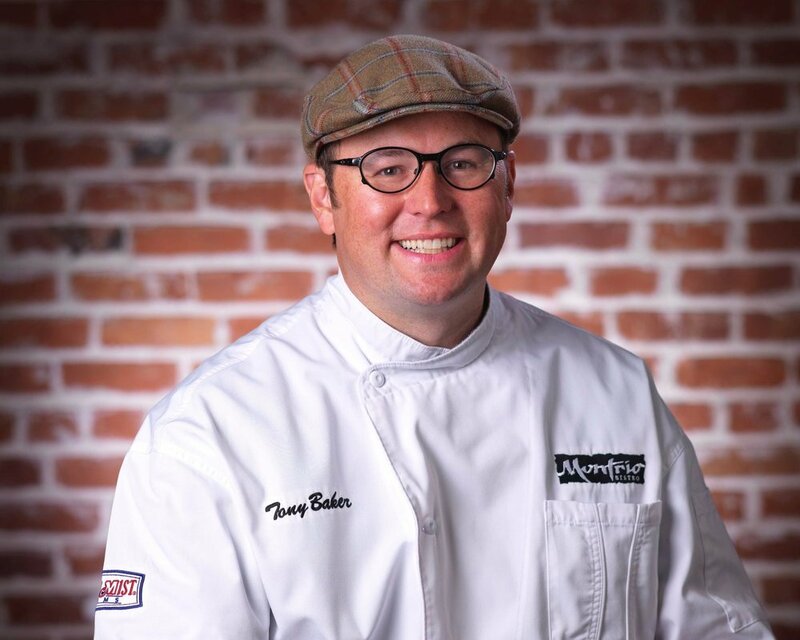 Tony’s awards and accolades are extensive, from the United Fresh Produce Excellence award to the American Culinary Federation’s 2018 Chapter Chef of the Year award to Edible Magazine’s Chef of the Year – Monterey and Chef Tony Baker continues to capture the attention of discriminating palettes across the globe. A California native raised in Hollister and San Juan Bautista, Chef Matt Bolton was immediately drawn to cooking during his first job as a dishwasher in a steakhouse at the age of 15. He never considered another career, and continued gaining culinary experience right out of high school. Since then, he has been at the stove finding a sense of satisfaction from the focused energy, split second timing, and creative artistry of cooking. In 2000, Bolton began working with notable Chef Cal Stamenov at Bernardus Lodge as Sous Chef for Marinus Restaurant. During his tenure, he learned the exacting techniques that are the foundation of great cuisine, as well as the value of impeccable, quality ingredients - philosophies that are at the heart of his cooking today. After almost 6 years of working under Chef Cal Stamenov, he would go on to acquire the reins at The Covey at Quail Lodge as Chef De Cuisine. From there, he enjoyed the legendary coastal view as Executive Chef of Pacific’s Edge at The Highlands Inn. Bolton’s cuisine is a daily celebration of the Monterey Peninsula and spotlights the treasure trove of local fisherman, foragers and farmers. Sitting where land and sea literally collide, The Intercontinental, The Clement Monterey emanates a coastal lifestyle and Bolton’s cuisine at the C restaurant, C bar and the hotel’s catering operations each exemplify this regional focus. The dining room offers scenic grandeur, in tandem with menus that weave the region’s agricultural, viticultural, ranching and marine histories. In support of the sustainable seafood movement and neighboring Monterey Bay Aquarium, his menus are built around the products recommended by the National Seafood Guide. Bolton’s approach to cooking is respectful, local and creative in-line with the rustic, natural beauty of the surrounding landscape. From the James Beard House to Rancho Cielo, The Chefs' Holidays at The Ahwahnee, The Culinary Classique, and Pebble Beach Food & Wine, cooking has given Matt Bolton the opportunity to support charitable efforts and community based organizations. His desire to support culinary education and youth opportunities brings his culinary training full circle. When he isn’t foraging on our 500-acre playground or whipping up fan favorites like Honey-Chili Chicken Wings or “I’m Stuffed” Baked Potatoes at Valley Kitchen, Chef Wood can be found cavorting with his merry band of food artisans and purveyors. “The best thing about working on the Central Coast is the ability to be so closely connected to local products and the people behind them," says Chef Wood. "When you know where your food is from and understand the care that the purveyors grant it, it’s easy to extend your hand in friendship and consider them part of your family." Chef Wood began his culinary career in the Catskills region of New York's Hudson Valley, where he learned the importance of local, seasonal ingredients—how they’re grown and how to be creative with them. This early awareness planted a seed that eventually led Chef Wood to Carmel Valley Ranch. Nestled in the heart of California's most fertile growing region, the area's rich history of wine growing and sustainable, organic farming is reflected in Tim’s award-winning menus. In fact, Chef Wood and Valley Kitchen have won many awards, most recently “Best Restaurant in Carmel Valley” in the Monterey County Weekly's 2018 Readers Poll. Salvatore Tedesco was born in Sicily and grew up the son of one of the famous Italian fisherman who gave the Monterey Fisherman's Wharf its name. He has worked in the restaurant business since he was 16 years old and developed his talent as a Chef over the past 20 years. Growing up in a Sicilian family, Sal has developed the gift of preparing rustic Italian & Sicilian dishes alongside traditional Wharf fare. Chef Philip Wojtowicz, is a Culinary Institute of America-trained chef who moved to California from his native New Jersey to work in some of L.A.'s top restaurants, then to Big Sur where he co-founded the iconic Big Sur Bakery. When not riding the surf or playing in his rock band Philip can be found at Poppy Hall, where friends pop by knowing that he will be talking to a fisherman friend about the fresh catch available and collaborating on another fabulous dinner special with partner Chef Brendan Esons. Karl Staub was raised near Buffalo, New York, and was influenced by his German parents passion for ‘garden to table’ cuisine. Born was an immediate love for the industry. Executive Chef Karl Staub attended Niagara County Community College in New York, receiving a degree in Culinary Arts and Hotel Management. 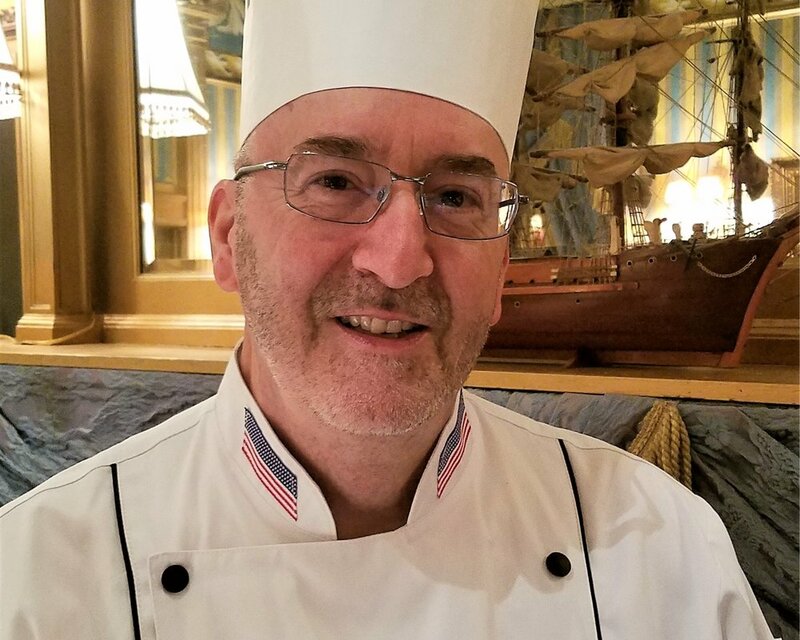 After his degree he fulfilled a two-year apprenticeship and moved to Florida to open ‘Le Chef’s de France’ restaurant in the French Pavilion at Epcot Center, as an apprentice under Paul Bocuse, Roger Verge and Gaston LeNotre. With many years of experience Karl’s professional journey has taken him from coast to coast working with some of America’s finest chefs and establishments, including the Ritz Carlton, Palm Springs; Lincoln Centre, Dallas; Plaza Las Fuentes, Pasadena; The Claremont Resort and Spa, Berkeley; The Sardine Factory, Monterey, Round One; and at the award-winning Seascape Beach Resort, Aptos. From the time he was able to walk, Executive Chef Alfonso Martinez drew his inspiration for cooking with his mother in their kitchen. Since that time, Chef has mastered his cooking skills at such Culinary powerhouses as the Rivoli Brasserie, Tijuana Mexico; Mustard Grill, Napa; and Ventana Inn, Big Sur. From his early inspiration and professional training, he developed a mastery of California Fusion techniques and flavors, incorporating foods into his dishes from Italy, France, Mexico, Japan and Eastern Asia, fusing them together to create his own unique and tantalizing dishes with a flair for presentation, which fits neatly into the diverse culture here on the beautiful Monterey Peninsula. Hailing from Zacatecas, Mexico, Juan Ponce has lived in the U.S. permanently since 1986. Realizing in his early 20s that he wanted to be in the culinary field after stints at some local restaurants, he eventually moved to the Old Fisherman’s Grotto and joined Executive Chef Mo Tabib. He soon achieved his goal of becoming executive chef and has now been at this iconic restaurant for 10 years. “I love working here,” Ponce says. “This restaurant has been open since 1950 and has a lot of history,” he says, adding how much he enjoys working for a company where the quality of food and service are paramount. 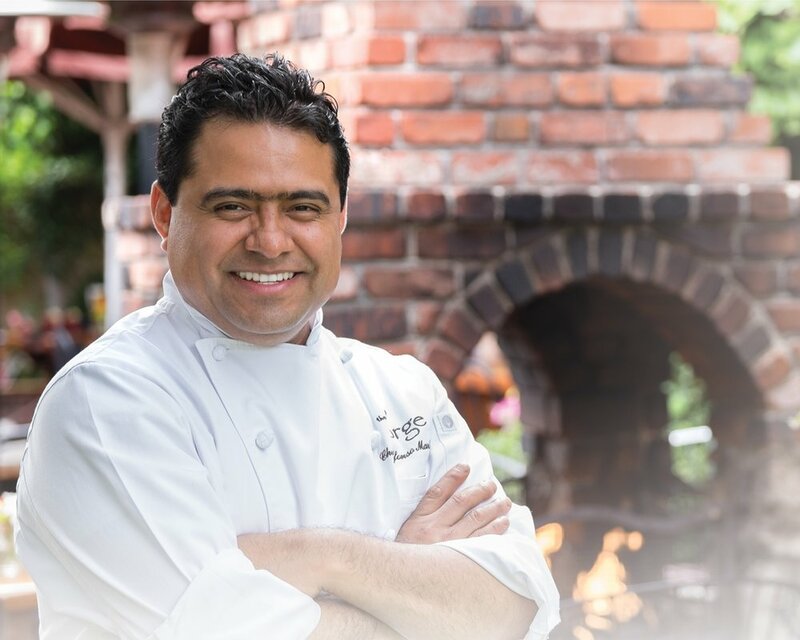 As executive chef, Ponce plans the menu and loves to prepare “something new and different.” And it’s all about using only freshest natural ingredients, prime beef and sustainable seafood. His daily orders of prime meat, local farmed raised Abalone, live Dungeness crab and Ahi tuna direct from Kona Hawaii are a few of the items available on the menu. Chef Ponce still finds time everyday to prepare over 15 fresh made decedent desserts. Chef Ponce has carried on many popular dishes on the restaurant’s menu that were created by the late founder Sabu Shake Sr and one of them is the famous clam chowder. It is one of the restaurant’s most-requested items and a local competition award winner for the last 10 years. Ponce met his wife, who is from the state of Jalisco in Mexico, when they both lived a block apart in Seaside. As a San Francisco Giants fan, he loves going to games with his three boys, now in their 20s, and relishes preparing special meals for his family at holiday times, especially from his treasured Zacatecas recipes. Growing up in the Willamette Valley in Oregon, Kurt’s love of food began from an early age. While other children may have hosted lemonade stands on the corner of their neighborhood, Kurt saved up to buy raspberry bushes, so he could harvest the berries to sell to neighbors. He began to experiment with culinary techniques by cooking apples from the family apple trees, testing out different cooking methods (four to be exact) to study the results. Kurt has always gravitated to great tasting food, with his love for food and entrepreneurial mind Kurt set out on what would be a career that has spanned almost four decades. Kurt has had the opportunity to work in some of the finest restaurants in the world. His apprenticeship began at the Clift Hotel in San Francisco. After his apprenticeship he refined his craft at Narsai’s in Berkeley, first as a saucier and then as chef. Kurt then had the chance to move to the east coast to work at the Pierre Hotel in New York as the Executive Sous Chef. In the years that followed he was at the three-star La Gavroche in London and Four Seasons in Boston. He returned to the west coast in 1986 to open 231 Ellsworth in San Mateo, which was soon considered one of the top restaurants in California during his time. In March of 1998 Kurt opened the door to his namesake restaurant: Grasing’s in Carmel. A Carmel classic for over two decades, Grasing’s restaurant has provided Kurt the opportunity to allow his love for food and entrepreneurial mind continue to develop. Grasing’s has expanded over the years to include additional dining space and the popular bar/lounge space. If you’d like your culinary experience out on the water, click here to see when you could go cruising with Kurt! Kurt has also extended his love for food to include jet catering for private planes coming in and out of Monterey. And now you may see Kurt around town in the Grasing’s van as he adds additional catering service available to the Monterey Peninsula!